The Chevy Camaro of the ’90s doesn’t get a whole lot of love, does it? Maybe because the Camaro nameplate died on the fourth-gen’s watch, maybe it just wasn’t that great of a car. Regardless, there are still a few out there that have been almost perfectly preserved. And they’re starting to look good again. A few days ago somebody showed me a listing for a 2001 Camaro SS six-speed (listed as a Z/28, but the badges tell a different story) in factory-fresh condition with less than 3,000 miles on the odometer. The car looks perfect, but the dealer selling it in North Carolina wants an ambitious $18,000 as of this writing. Naturally, that led me down a rabbit hole of 1992 to 2002 Camaro classified ads to see if there were any other top-trim manual-shift fourth-gen Camaros available at this level of tidiness. 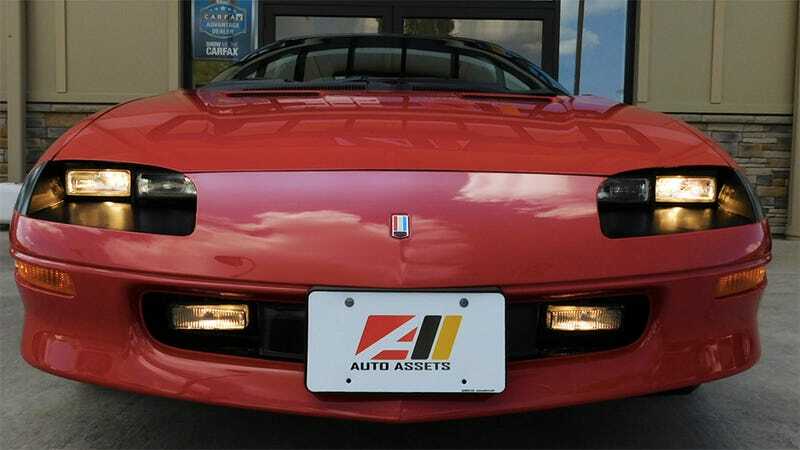 Lo and behold, a Bright Red 1994 Z/28 V8 six-speed t-top car with only 8,700 miles on the clock just sold on Bring A Trailer for a few bucks over $10,000. The 1994 car would have been a few horsepower shy of the 2001 Camaro’s output, the interior was a touch more basic and of course the front clip wasn’t as sleek. But to be honest, I like the interior/exterior coloring of this older car better than the Pewter one in Carolina even if the newer car’s objectively superior. The 5.7-liter V8 was rated at 275 horsepower and 325 lb-ft of torque in the earlier Z/28s, and of course 1994 would have been pre OBD-II. As the fourth-gen Camaro got older, it received updates to its suspension, driveline, and engines. The SS was rated to 325 HP after its final tweaks for the 2001 model year. These things were all boats at over 16 feet in length, but weighting 3,500 pounds at most they were almost light by today’s pony car standards: A 2017 Camaro can crest 4,000 in some trims. If the badges on the car in that Carolina dealer’s listing are accurate, that may well be the Best Fourth Gen Camaro left on the open market. But $10,011 for a super-clean red one with all the right options and less than 10,000 miles on the odometer seems well-bought to me. Should I Get A Certified Pre-Owned Warranty Or A CarMax Warranty?